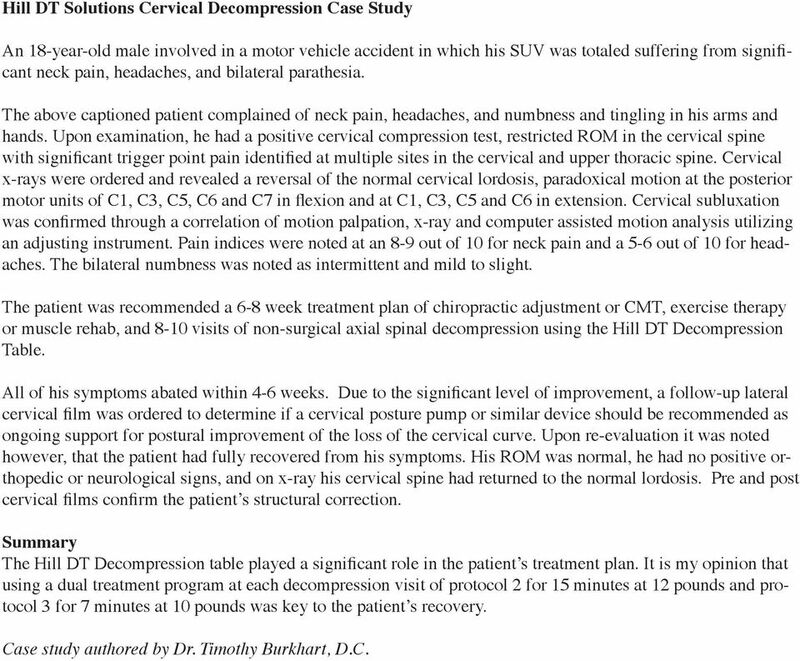 Download "Case Studies Updated 10.24.11"
2 Hill DT Solutions Cervical Decompression Case Study cant neck pain, headaches, and bilateral parathesia. 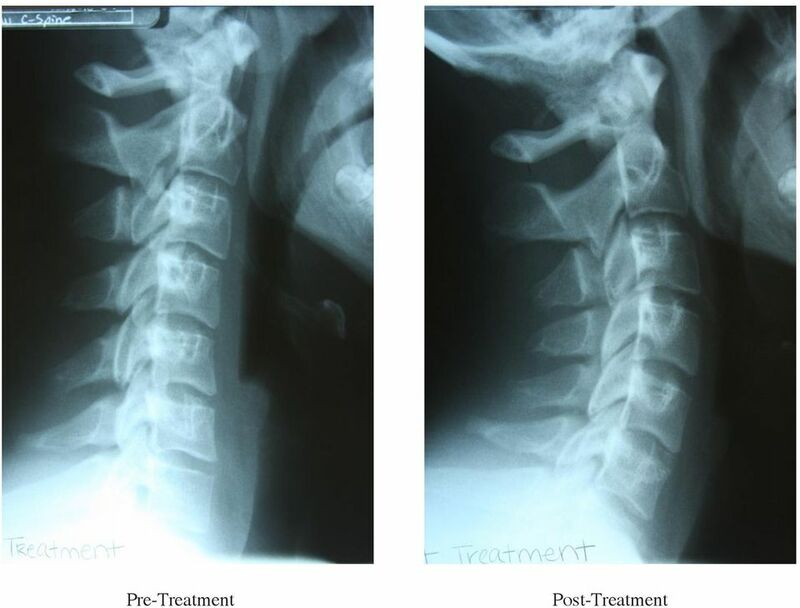 The above captioned patient complained of neck pain, headaches, and numbness and tingling in his arms and hands. 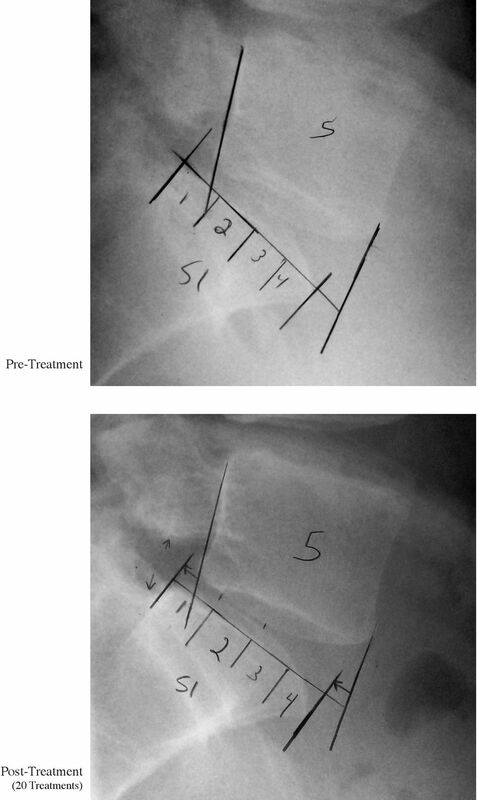 Upon examination, he had a positive cervical compression test, restricted ROM in the cervical spine x-rays were ordered and revealed a reversal of the normal cervical lordosis, paradoxical motion at the posterior aches. The bilateral numbness was noted as intermittent and mild to slight. 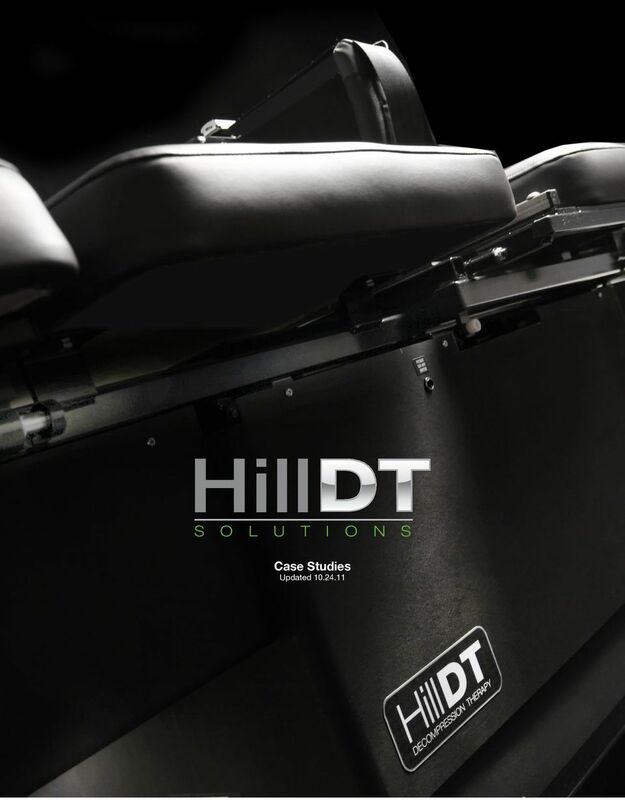 or muscle rehab, and 8-10 visits of non-surgical axial spinal decompression using the Hill DT Decompression Table. 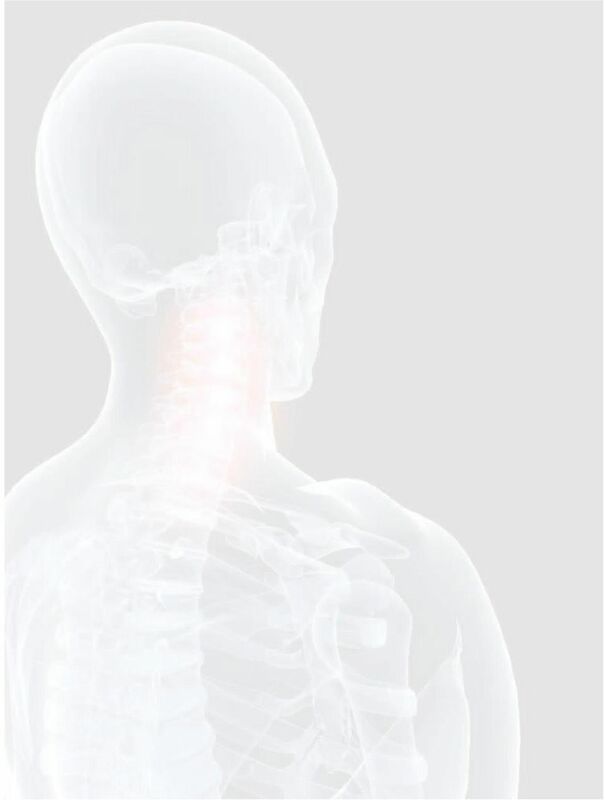 ongoing support for postural improvement of the loss of the cervical curve. Upon re-evaluation it was noted however, that the patient had fully recovered from his symptoms. His ROM was normal, he had no positive orthopedic or neurological signs, and on x-ray his cervical spine had returned to the normal lordosis. 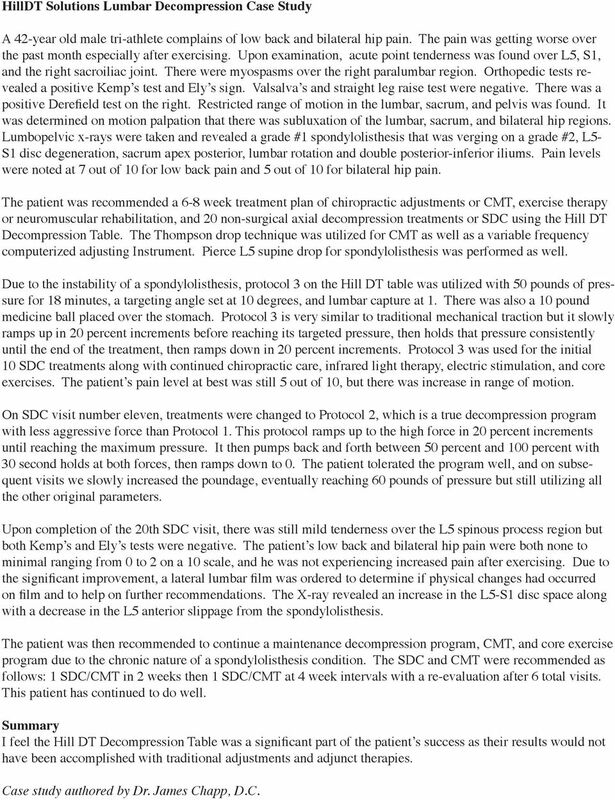 Pre and post Summary - Case study authored by Dr. Timothy Burkhart, D.C.
4 HillDT Solutions Lumbar Decompression Case Study A 42-year old male tri-athlete complains of low back and bilateral hip pain. The pain was getting worse over and the right sacroiliac joint. There were myospasms over the right paralumbar region. Orthopedic tests re- was determined on motion palpation that there was subluxation of the lumbar, sacrum, and bilateral hip regions. 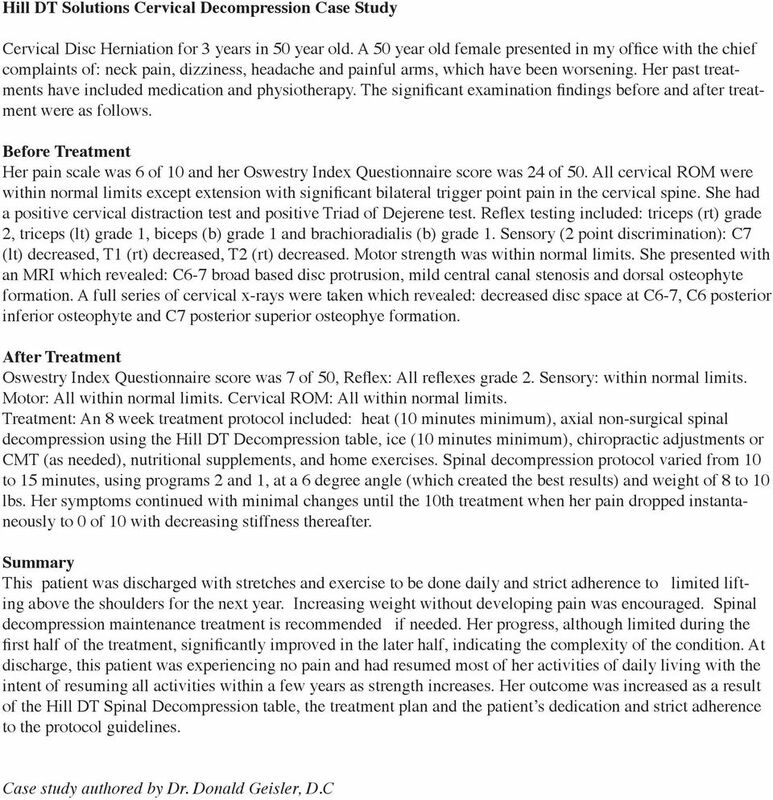 S1 disc degeneration, sacrum apex posterior, lumbar rotation and double posterior-inferior iliums. Pain levels sure for 18 minutes, a targeting angle set at 10 degrees, and lumbar capture at 1. There was also a 10 pound ramps up in 20 percent increments before reaching its targeted pressure, then holds that pressure consistently with less aggressive force than Protocol 1. This protocol ramps up to the high force in 20 percent increments - the other original parameters. minimal ranging from 0 to 2 on a 10 scale, and he was not experiencing increased pain after exercising. Due to This patient has continued to do well. Summary have been accomplished with traditional adjustments and adjunct therapies. 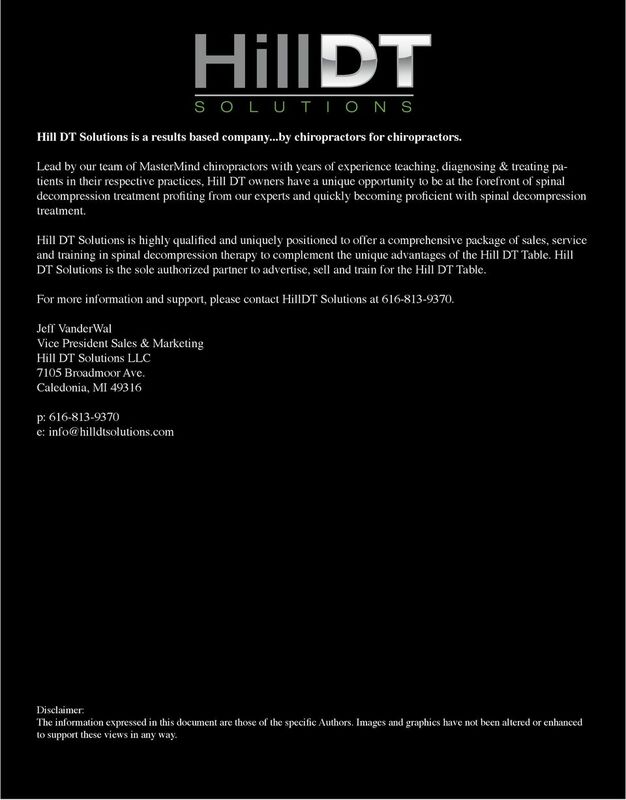 Case study authored by Dr. James Chapp, D.C.
8 Hill DT Solutions is a results based company...by chiropractors for chiropractors. Lead by our team of MasterMind chiropractors with years of experience teaching, diagnosing & treating patients in their respective practices, Hill DT owners have a unique opportunity to be at the forefront of spinal treatment. and training in spinal decompression therapy to complement the unique advantages of the Hill DT Table. Hill Jeff VanderWal Vice President Sales & Marketing e: S O L U T I O N S Disclaimer: to support these views in any way. Rule of Thumb: think do I need to stabilise, strengthen or mobilise? CASE NO. 18 Z 600 01641 03 2 A M E R I C A N A R B I T R A T I O N A S S O C I A T I O N NO-FAULT/ACCIDENT CLAIMS In the Matter of the Arbitration between (Claimant) AAA CASE NO. : 18 Z 600 01641 03 v.
ExtenTrac Elite. Advanced Back Technologies, Inc. An International Manufacturing Company. Advanced Back Technologies, Inc. Freedom.